Enhanced with the active benefits of aromatherapy pure essential oils and Australian native extracts, Mayella ® Skincare Vitamin A Night Serum has been formulated containing certified organic and bio-active botanicals. A vegan, 100% plantbased daily vitamin serum that is suitable for all skin types, women, men and teens. 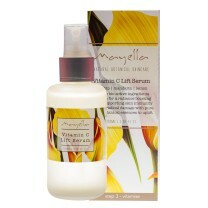 Mayella ® Vitamin A Night Serum is our highly concentrated anti-ageing and regenerative vitamin serum. Actively contributing to the process of skin regeneration, promoting smooth skin tone, restoring damage from UV radiation, Blue light and LED’s – an integral step in repairing mature skin, dry skin through to break out or acne skin. Vitamin A (Retinyl Palmitate), has a diversity of positive supporting roles in skin health – all of which are powerfully enhanced when combined with native extracts, aromatherapy pure essential oils and our heroine ingredient Olivane ™. Pure lavender and bergamot offer powerful healing and calming properties while working as a natural antibiotic and reducing cellular inflammation. Fused with the benefits of pure jasmine to support hydration, balance and energise the skin for complete overnight regeneration. 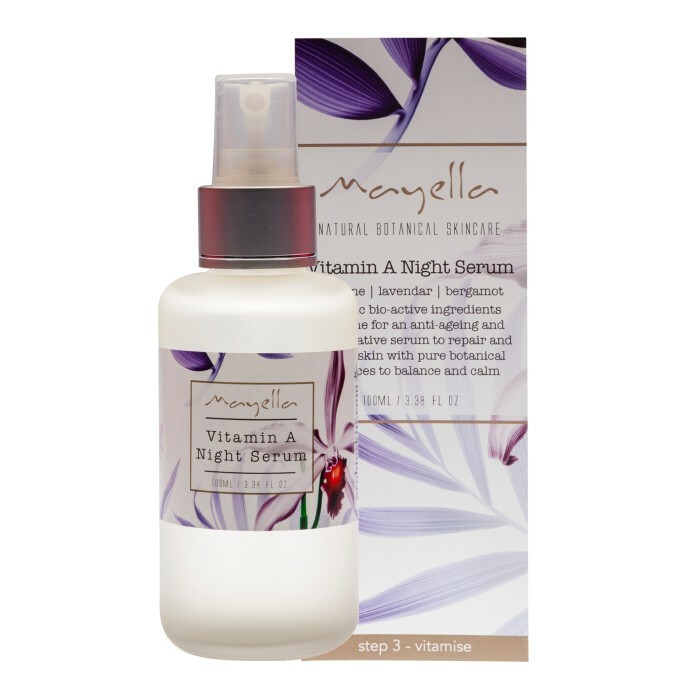 Using Mayella ® Vitamin A Night Serum at night is in sync with our skins natural action of repair and renewal functions busily happening while we are resting. Research has shown that UV exposure depletes levels of Vitamin A in the skin. Continuously our skin is exposed to a number of environmental stresses in our everyday activities. Night is a time when our environment is relatively controlled, our bodies are generally calm and rest, repair and renewal are the three R’s our body is totally focused on in all areas of our being. Mayella ® Vitamin A Night Serum actively contributes to the process of skin regeneration and is involved with keratinization, the thickening and hardening of our skin cell walls as they age and rise to the surface. Keratinization forms a protective wall in cells and means our skins surface can protect us from the environment stressors, UV radiation, Blue light etc we are exposed to daily. Healthy cell walls and ensure our skin is able to repel water, oils and other fluids from compromising our protective layer – the skin. Keratinization and the epithelial “glue” binding these hardened cells together importantly enables the skin to prevent harmful bacteria and germs from penetrating the skin. As we age, the tendency is for our skin to thin and become more delicate – giving it less integrity. Mayella ® Vitamin A Night Serum is the perfect serum for mature skin to help regulate this gradual thinning of the skin cell walls. Critically, Vitamin A plays a vital role in the youthfulness of skin by accelerating cell renewal and stimulating the Fibroblast cells. The Fibroblasts are common cells of connective tissue, responsible for synthesizing elastin and collagen – a protein making up 25%–35% of our body’s connective tissue in healthy mammals and are vital in the process of wound healing. Collagen is a long fibril type protein, with each collagen fibre found as a bundle of these tiny fibrils in the skin, tendons and ligaments. In healthy skin, these tiny fibres create a very ordered alignment and type of mat like structure giving the skin tone, integrity and a plump firmness. This ordered structure is needed to prevent formation of fine lines and wrinkles. However the tendency is for the Collagen structure to weaken as we age. It is Vitamin A’s role in building healthy skin cell walls, the stimulation of cell division, cell growth, and collagen formation that also makes it a perfect serum to support a youthful skin appearance, scar tissue repair and balance acne skin. The presence of Vitamin A in the skin increases the activity of enzymes found in the skin. Enzyme action is vital for active epidermal function and a youthful skin. As amongst the many essential functions Enzymes are involved in, Enzymes are responsible for dissolving the glue that binds the fully mature skin cells together, allowing at the appropriate time the dead, fully mature cells to fall/be removed from the skin’s surface. The younger mature cells in their place becoming the fresh epithelial surface. Readily absorbed by the skin and most effective at a cellular level, Mayella® Vitamin A Night Serum is a key factor in reducing fine lines and wrinkles. It is a powerful antioxidant and “maintenance” Vitamin for the skin as well as a stimulant for healthy active skin function and aiding with scar tissue repair, breakout and acne skin. A key factor in “switching on” genes responsible for bringing immature cells into maturity, Vitamin A is necessary in maintaining the epithelial cycle of cell renewal and growth. Mayella ® VItamin A Night Serum is greatly beneficial for acne or breakout skin, assisting in calming and regulating the skin cell cycle to avoid cysts, swelling, scar tissue and the irritation that you feel under your skin when break out is building. In accordance with usual health care recommendations for Vitamin A -not recommended for women during pregnancy. Shake bottle well and disperse 1–2 sprays of Vitamin A Night Serum onto clean dry hands. Apply to your whole face and neck, massaging serum in gently with an upward circular motion. Concentrate on areas of concern, in particular breakout prone and/or under the eye area. Face and neck will be left feeling regenerated, calm and ready for Step 4 – Nourish. Not recommended for women during pregnancy.